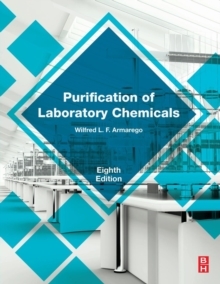 Purification of Laboratory Chemicals, Eighth Edition, tabulates methods taken from literature for purifying thousands of individual commercially available chemicals. To help in applying this information, the more common processes currently used for purification in chemical laboratories and new methods are discussed. For dealing with substances not separately listed, a chapter is included setting out the usual methods for purifying specific classes of compounds.